India is the largest provider of generic drugs globally. Indian pharmaceutical sector industry supplies over 50 per cent of global demand for various vaccines, 40 per cent of generic demand in the US and 25 per cent of all medicine in UK. 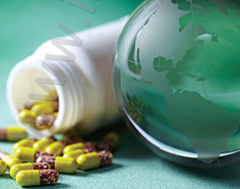 India enjoys an important position in the global pharmaceuticals sector. The country also has a large pool of scientists and engineers who have the potential to steer the industry ahead to an even higher level. Presently over 80 per cent of the antiretroviral drugs used globally to combat AIDS (Acquired Immune Deficiency Syndrome) are supplied by Indian pharmaceutical firms. The pharmaceutical sector was valued at US$ 33 billion in 2017. The country’s pharmaceutical industry is expected to expand at a CAGR of 22.4 per cent over 2015–20 to reach US$ 55 billion. India’s pharmaceutical exports stood at US$ 17.27 billion in FY18 and have reached US$ 15.52 billion in FY19 (up to January 2019). Pharmaceutical exports include bulk drugs, intermediates, drug formulations, biologicals, Ayush & herbal products and surgicals. India’s domestic pharmaceutical market turnover reached Rs 129,015 crore (US$ 18.12 billion) in 2018, growing 9.4 per cent year-on-year (in Rs) from Rs 116,389 crore (US$ 17.87 billion) in 2017. Indian companies received 304 Abbreviated New Drug Application (ANDA) approvals from the US Food and Drug Administration (USFDA) in 2017. The country accounts for around 30 per cent (by volume) and about 10 per cent (value) in the US$ 70-80 billion US generics market. India's biotechnology industry comprising bio-pharmaceuticals, bio-services, bio-agriculture, bio-industry and bioinformatics is expected grow at an average growth rate of around 30 per cent a year and reach US$ 100 billion by 2025. The Union Cabinet has given its nod for the amendment of the existing Foreign Direct Investment (FDI) policy in the pharmaceutical sector in order to allow FDI up to 100 per cent under the automatic route for manufacturing of medical devices subject to certain conditions. The drugs and pharmaceuticals sector attracted cumulative FDI inflows worth US$ 15.93 billion between April 2000 and December 2018, according to data released by the Department for Promotion of Industry and Internal Trade (DPIIT). In February 2019, the Indian pharmaceutical market grew by 10 per cent year-on-year. Between Jul-Sep 2018, Indian pharma sector witnessed 39 PE investment deals worth US$ 217 million. Investment (as % of sales) in research & development by Indian pharma companies* increased from 5.3 per cent in FY12 to 8.5 per cent in FY18. The exports of Indian pharmaceutical industry to the US will get a boost, as branded drugs worth US$ 55 billion will become off-patent during 2017-2019. The allocation to the Ministry of Health and Family Welfare has increased by 13.1 per cent to Rs 61,398 crore (US$ 8.98 billion) in Union Budget 2019-20. In October 2018, the Uttar Pradesh Government announced that it will set up six pharma parks in the state and has received investment commitments of more than Rs 5,000-6,000 crore (US$ 712-855 million) for the same. The National Health Protection Scheme is largest government funded healthcare programme in the world, which is expected to benefit 100 million poor families in the country by providing a cover of up to Rs 5 lakh (US$ 7,723.2) per family per year for secondary and tertiary care hospitalisation. The programme was announced in Union Budget 2018-19. In March 2018, the Drug Controller General of India (DCGI) announced its plans to start a single-window facility to provide consents, approvals and other information. The move is aimed at giving a push to the Make in India initiative. The Government of India is planning to set up an electronic platform to regulate online pharmacies under a new policy, in order to stop any misuse due to easy availability. The Government of India unveiled 'Pharma Vision 2020' aimed at making India a global leader in end-to-end drug manufacture. Approval time for new facilities has been reduced to boost investments. Medicine spending in India is projected to grow 9-12 per cent over the next five years, leading India to become one of the top 10 countries in terms of medicine spending. Going forward, better growth in domestic sales would also depend on the ability of companies to align their product portfolio towards chronic therapies for diseases such as such as cardiovascular, anti-diabetes, anti-depressants and anti-cancers that are on the rise. The Indian government has taken many steps to reduce costs and bring down healthcare expenses. Speedy introduction of generic drugs into the market has remained in focus and is expected to benefit the Indian pharmaceutical companies. In addition, the thrust on rural health programmes, lifesaving drugs and preventive vaccines also augurs well for the pharmaceutical companies.